The Digby Stuart College campus, University of Roehampton, was, until 1947, the site of a Community and school for the Society of the Sacred Heart. 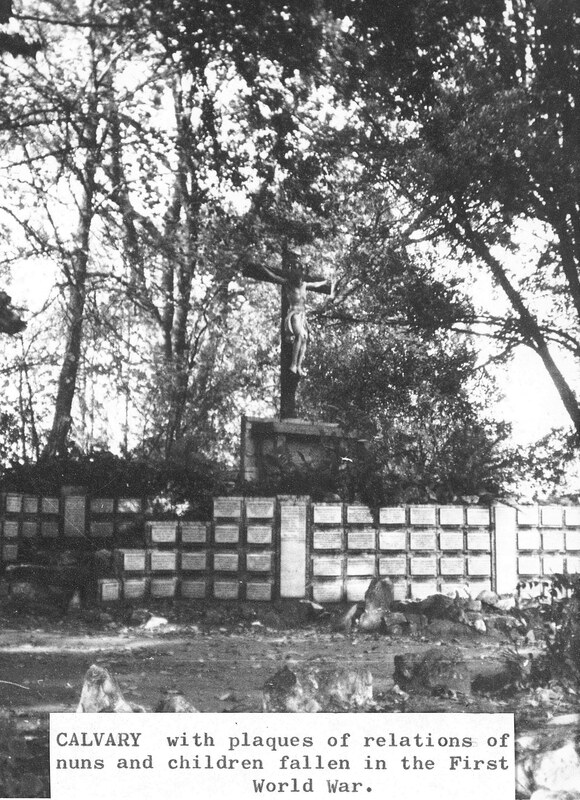 In 1883 the nuns built their Calvary on the West side of the grounds, near the boundary fence. It became the ideal location for a War Memorial to all the relatives of the nuns and pupils of the convent killed in the war. Documents in the Societies archives record that the Memorial was dedicated on 24 May 1918 by the Revered W Roche SJ. Initially for the fallen of the WWI the memorial commemorates 1 from the Boer War, 275 from WWI, 11 from WWII and 1 from the Korean War. There is no set pattern for the inscriptions; families were left free to compose their own. Officers and other ranks were generally separated, but not always. 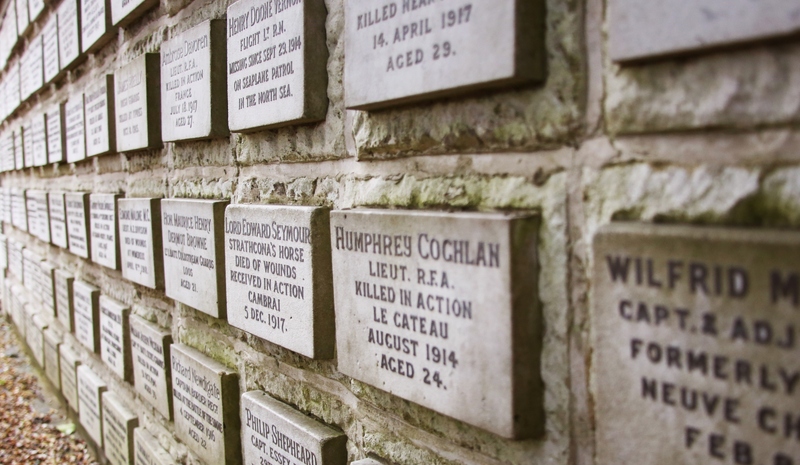 The plaques are marble with lead letters attached to a Portland stone background. In 1972 the Memorial had to be moved to make room for the expansion of Digby Stuart College. Initially J. Whitehead & Sons Ltd, Kennington, London were engaged to carry out the work but then there were delays, for various reasons, and in October 1973 the completion of the Memorial was given over to a Mr Baker (there are no noted details of who he was) – a handwritten note states, ‘Finished by Mr Baker in June 1974’. Additional work was carried out in 1980. In its current location it measures 1.9 metres high by 11.3 metres wide and in 2000 it was described as ‘a magnificent war memorial, absolutely unique’ by a representative of The National Inventory of War Memorials, Imperial War Museum. This year, the University in collaboration with the Society’s archive,s have undertaken to trace relatives of those honoured on the Memorial in order to find the stories of those fallen so that they won’t be forgotten. It is hoped to that these accounts will be published in 2018 to mark the centenary of the Memorial. A few weeks ago I was in St Mary’s Church showing someone the war memorial around which the Summerstown182 project is based. I was full of stories about the individuals on it, where they lived, where they were buried, whose relative had been on one of our walks. It suddenly dawned on me that in a little under a year, what was a wall of unknown names is slowly coming spectacularly to life. The two soldiers buried in Jerusalem. The three brothers from Thurso Street killed in successive years. The young man who was lost in the North Sea on a submarine. 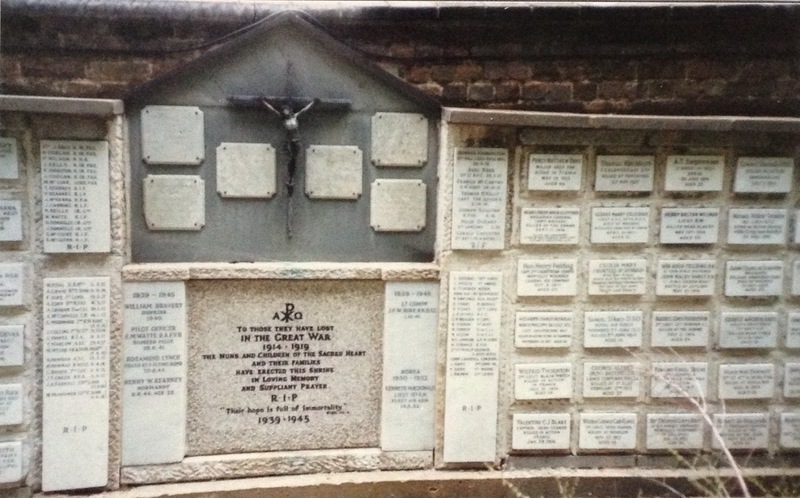 The brothers who died of tuberculosis and are buried in unmarked graves in Streatham Cemetery. The jilted soldier who threw himself under a tram in Garratt Lane. We know something now about 174 of the names, only eight can’t so far be connected with this area. It surprised and saddened me that very little seemed to be known about the men on the war memorial. The blog which I started has evolved into a collection of stories about them. Each post is centred around one of the individuals using information from the parish magazines of the period and Commonwealth War Graves Commission database. This is blended together with census records and other material which local enthusiasts keen to get involved in the project have kindly provided. Without their help this project just wouldn’t be possible. Now relatives are slowly coming forward, providing photographs and nuggets of precious detail to add to the stories. We have established connections with descendants in Taunton, Tamworth, Cambridge, Luton and as faraway as Melbourne, Australia. Closely related to the stories of the soldiers themselves has been a developing desire to understand the world which they inhabited. Local newspapers from the time, available for study through Wandsworth Heritage Service at Battersea Library, have been invaluable for providing an impression, though it has amazed me that there seemed sometimes more concern with ‘interesting local weddings’ than what was happening across the Channel. Lists of names which followed the immense 1915 losses at the battles of Festubert and Loos soon trickled away, undoubtedly to preserve morale. What is of more interest to me is the conditions at home that the war created. How a German baker in Tooting had his premises repeatedly trashed, despite the fact his son was serving in the British army. How a soldier’s impoverished wife was imprisoned for being unable to care for her starving children. Undeniably the conditions for people living around here were difficult in the extreme. Occasionally I recognise names, an inquest into the soldier who walked out of the Fountain pub and under a tram, the young lad who a few months before joining the Welsh Fusiliers was arrested in Khartoum Road for playing ‘pitch-and-toss’. The barmaid who got into hot water for serving a wounded soldier in The Castle. There are many more to discover. I’ve just pricked the surface. What a wonderful resource we have there. If you would like to hear more about the project or the guided walks which have been developed to promote it, please come along to hear me talk about it at the next meeting of Tooting History Group. This is in the United Reformed Church, Rookstone Road, Tooting on Tuesday 11th November at 730pm.The next guided walk will be on Saturday 6th December.